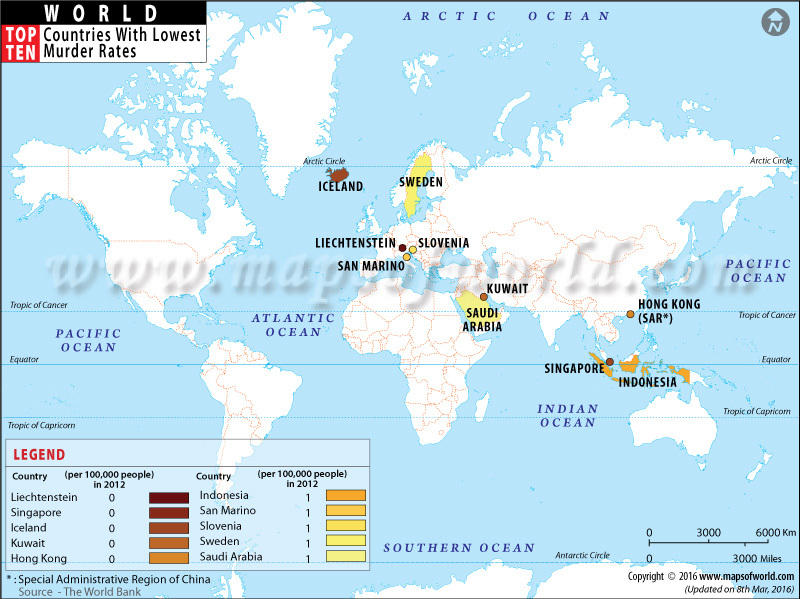 The map of top ten countries with lowest murder rates is based on the average crime murder rates. The top countries with lowest murder case are Monaco, Palau, Hong Kong and Singapore. Safety and security of a country depends on the number of crimes that take place in any year. Crime rate also incorporates the number of murders happened. These particular map of countries with the lowest murder talks about the some of the safest countries in the world when it comes to murders. Countries with the lowest murder rates map indicates those ten countries of the world which have a murder rate of less than 1 person per 100,000 population. This map indicates data of reported murder per 100,000 oh population of these ten countries of the world. Countries with the lowest murder rates show that Iceland is the only country of the world where no death or crime is caused due to murder. This list of top ten countries with the lowest murder rates clearly indicates that most of the countries like Gambia, Senegal, Mali and Cameron belong to the African continent. Rates are calculated per 100,000 inhabitants.